Hystax Acura is available for MSPs and Cloud Service Providers as a platform for Disaster Recovery as a Service with sophisticated customer management portal, billing and user management. Hystax Acura supports client-side deduplication and WAN-optimization and can handle customers with narrow network bandwidth. Solutions is fully covered with RESTful API and can be integrated with existing PSA tools. Hystax Acura can provide on-premise Disaster Recovery capabilities between different regions / sites or availability zones. The solution supports cross-hypervisor DR with low RPO and RTO values – customers can use KVM-based platforms or Amazon Web Services as a Failover cloud. Hystax Acura supports fully-automated asynchronous failback of workloads to original location. The solution supports cloud backup scenarios with hot and cold storage and flexible retention policies. Huge variety of hardware or SDN storage vendors and solutions can be used: NetApp, DellEmc, Cisco, Nexenta, Ceph etc. Data is stored in a resilient and optimized way with deduplication ratio of up to 70%. Restores with constant snapshot access time are available. To get more information on product usage and capabilities download Hystax Acura Full Product Specification. Get a robust Backup and Disaster Recovery solution and save on Disaster Recovery infrastructure and licenses. Hystax Acura uses robust cloud virtualization solution and you don’t need to buy VMware licenses for DR site. 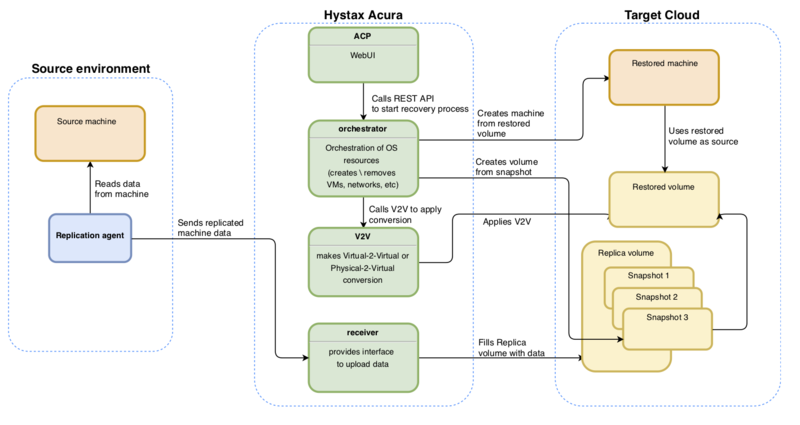 Hystax Acura supports native cloud API to replicate and store data. All the snapshots are stored in a storage-agnostic format. Any hardware and SDN storage solution can be used underneath. Hystax Acura creates cinder volumes and cinder snapshots on OpenStack and EBS volumes and snapshots on Amazon Web Services. Hystax Acura supports external and internal replication of business applications. External replication saves time to deploy agents and works ideally for VMware and OpenStack workloads. Internal agents are available for public & private cloud and Bare Metal servers, Azure, Google Cloud Platform, Alibaba Cloud, VMware, Hyper-V, OpenStack, Oracle Cloud, KVM, Bare Metal. Hystax Acura can be installed in your datacenter to meet regulations and give full control on backup infrastructure. To give significant TCO cost reduction and reduce risks of disaster effecting BCDR infrastructure Hystax Acura can be installed in a public cloud / datacenter so you can use a remote DR site and switch to it at any time. Best-in-class RPO/RTO, no disk preparations or copying data, Hystax Acura boots devices directly from Snapshot storage. VMware, Hyper-V, KVM or Virtuozzo are used as DR site platform. Powerful failback to production helps return your infrastructure back without data loss and in a planned downtime window of minutes. Create Disaster Recovery plan once and Hystax Acura will automatically run Cloud Sites on schedule. You get reports on tests and always know what to expect in case of IT failure. 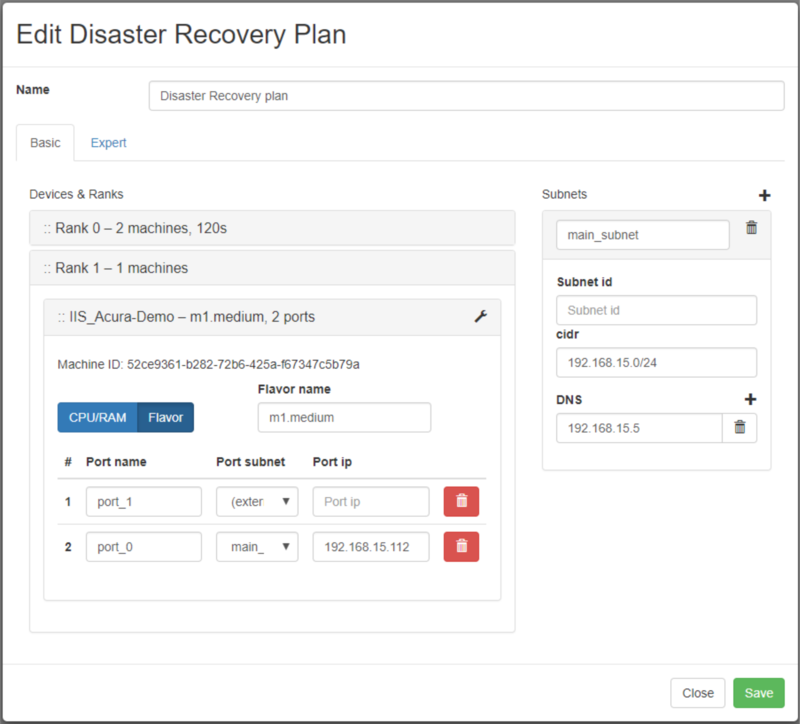 Create custom user roles and divide access to Disaster Recovery resources – reduce risk of human error in Disaster Recovery infrastructure. Audit all actions and monitor activity. Build your own Disaster Recovery, Migration & self-healing scenarios using powerful Hystax Acura REST API. Integrate solution with your monitoring and alerting systems to address all issues with IT infrastructure. 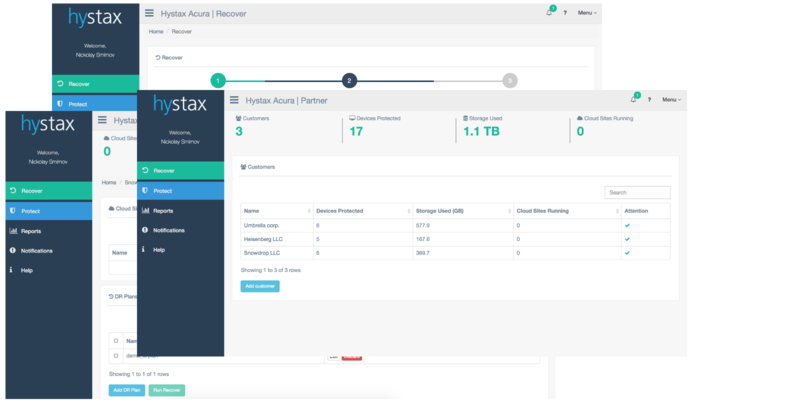 Hystax Acura pioneered cross-hypervisor Disaster Recovery and stores customer data and snapshots in a cloud-native format, ready to use in case of failover. No cloud modifications are required to support Disaster Recovery scenarios, only native API is used to create basic routines like volumes, snapshots, subnets and virtual machines. Hystax Acura uses EBS and cinder functionality to create volumes and snapshots on Amazon Web Services and OpenStack / KVM. No underlying hardware or SDN is used – any storage can be used for storage which helps customers to work with familiar solutions and re-utilize existing hardware in case of Disaster Recovery to private cloud. 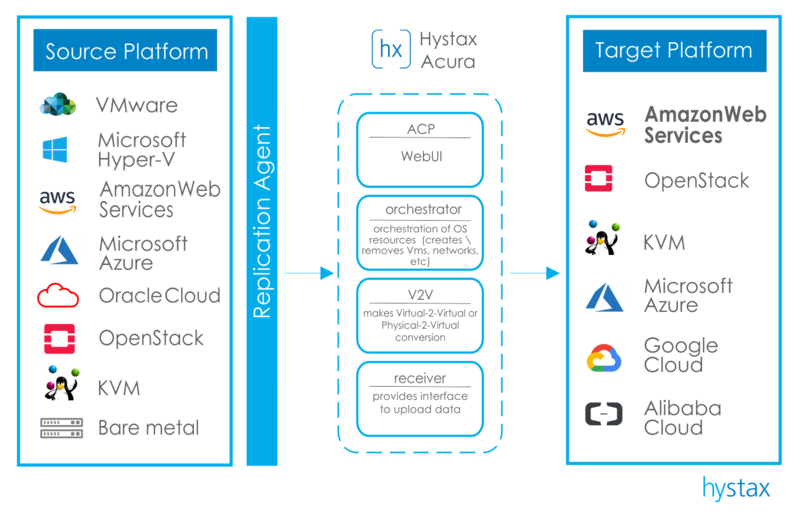 Hystax Acura agent consistently replicates business applications on a protected platform, calculates deltas and sends them to a snapshot storage. Data is stored in a ready-to-launch format. All P2V / V2V processes are fully-automated and executed in the background. The solution supports orchestration and lets configure dependencies between components of business applications. Restored machines are not tied to Hystax Acura – there is no performance impact in case of failover. To learn more about product features and customer values download Hystax Acura Disaster Recovery WhitePaper. Hystax Acura provides you with powerful and flexible DR plans which contain all necessary information to recreate your original production workloads. DR plans are generated automatically based on replicated infrastructure, you just need to revise it. Hystax Acura supports cloud orchestration and recreate infrastructure in a pre-defined order. Regular automatic DR plan testing is available. Hystax Acura will automatically create a cloud site from your DR site and run a bunch of test scripts. Testing reports are available.